Many interesting things happened in last nights games. 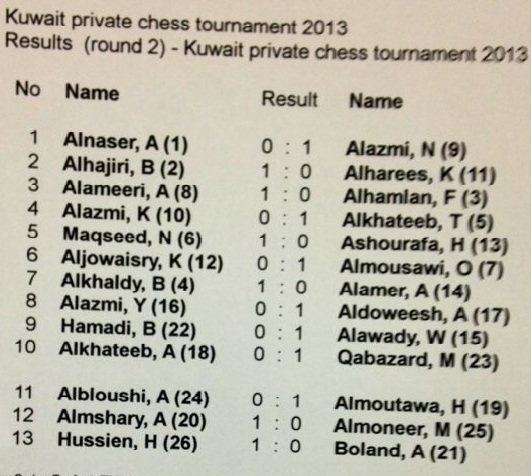 Faisal Al Hamlan was crushed by Adel Al Amiri’s tactics, which won him a piece. Al Hamlan defended well by still ended up with a loss. Amer Al Amer had a decisive advantage against Bader Al Khaldi early in the game. But decided to play it safe, which ultimately lost him the game. That shows that you have to be aggressive all the time otherwise you’ll lose your edge. Other players also enjoyed the fact the time control was improved by having an additional 30 seconds instead of the 20 seconds. Other new players did rather well. Ahmad Al Daweesh drew his 1st match against Bader Al Khaldi and won in the 2nd round, putting him against tougher opponents now. We also would like to introduce new players into the scene. 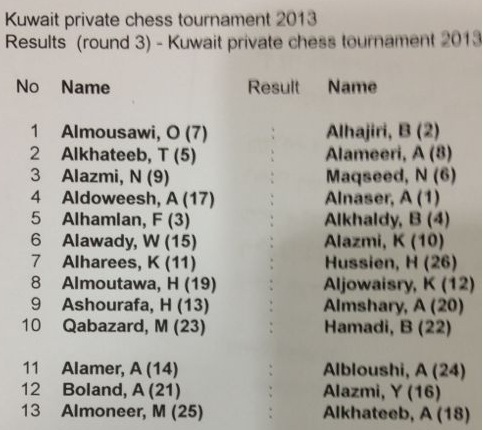 Bader Al Hamadi, Ali Boland, Abdullah Al Baloushi and A. Al Nasser as this is thier 1st but not last tournament. We wish them the very best of luck. As they all show promise. Training with the new coach will improve thier skills along with the other players. And here are a few pictures of the players. More pictures will be uploaded with each round.